This is a gorgeous china pattern! 5 piece place setting includes Cup and saucer. Bread and butter plate. Old Mark Royal Albert Crown China England Heirloom pattern square saucer exc antique condition with hanger. The feet on the bottoms of both are a bit soiled from use (see pics) but may be able to be cleaned off if this is an issue. Pre owned - most pieces still in plastic wrappers / Hairline crack on handle of teapot. 8 Saucers - 5 ½" dia. 1 Tea Pot - 10" Handle to Handle 8 ½"H (hairline crack to handle as pictured). Pieces can vary by size, weight, air bubbles and markings. This is a beautiful porcelain coffee pot in the blue Moonlight Rose pattern by Royal Albert. ROYAL ALBERT 'Moonlight Rose' small mug in good condition. Royal Albert updates a classic with the playfully patterned Polka Rose cup and saucer. Tea Cup and Saucer Set: New In Box: Perfect Condition. Bone china. Excellent condition! Minimal gold loss. Colors are vibrant! NO GOLD LOSS ON THE SCALLOPED EDGE. This is a beautiful Royal Albert teacup and matching saucer. Made in England from the finest bone china this is done and a beautiful soft baby blue coloring with a brilliant floral emblem. It is in excellent condition with no signs of any use. 2 ANGLETERRE ENGLAND "VINEYARD" PLATES 11" PURPLE GRAPES BLUE MADE FOR PIER 1. Large teapot. This is a gorgeous china pattern! The teacup looks majestic with the footed base sitting on the plate. Orchard inside cup. Tea Cup & Saucer #1014?. Saucer 5-1/2” diam. Very tiny scratch in saucer pictured. Cobalt Blue Gold Trim. Signed D. Jones. It is part of the Overture Series. This lovely set is a beautiful aqua blue green colour Excellent condition and a great addition to your collection. Royal Albert Teacup & Saucer. one CUP & SAUCER ROYAL ALBERT regal series cobalt blue, white, gold. #L6 one CUP & SAUCER ROYAL ALBERT cobalt blue white GOLD R egal series. After careful examination I would say this is in GOOD Condition. VERY GOOD for old cup & saucer. A Royal Albert teapot lid. If you have a teapot and no lid and you'll probably be happy to find one even such as this. Tea Trio includes Pattern: Flower of The Month (Montrose shape) by Royal Albert. Footed tea cup. A few very faint and tiny scratch scuffs from storage on the salad plate that are very insignificant and not visible in the pictures (not utensil marks). Vibrant colors and playful designs make it this season's must-have for any fashion follower. Give the sweetest gift with the hot new Candy Collection from Royal Albert. 10.5 oz Capacity. ROYAL ALBERT MIRANDA KERR EVERYTHING MUG IN TIN BLUE BRAND NEW! Gaiety Series teacup and Saucer Minuet Blue with tiny pink roses England Excellent condition. Set includes a salad plate, cup in the Avon shape and saucer. Bases are stamped with the Royal Albert Crown, Bone China ENGLAND, used beginning in 1946. They have often been used for many years and can have normal signs of wear. Royal Albert England Bone China Sonatina Gravy Boat Pristine Condition! 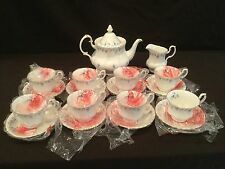 Royal Albert Heirloom England Porcelain Set Of 6 Tea Cup Saucer And Dessert Plate. IT APPEARS USED VERY LITTLE, BUT MAY HAVE A SCRATCH TO THE INNER GOLD RING. THIS IS NOTHING MAJOR JUST POINTING OUT ANY POSSIBLE FLAWS. PICK IT UP AT A FRACTION OF CURRENT MARKET VALUE. Royal Albert Bone China Blue Titmouse The Woodland Birds' Collection decorative plate. One of a collection of four plates from original work by Reginald A. Johnson. Royal Albert Ltd. 1982. Royal Albert Bone China Tea Cup & Saucer Teal Flowers & Gold Trim Badminton Series 1983 England. Has a little hallmark stamp but i do not know the maker. Blue in color. Can be used for different things but i think its mainly for toothpicks. 4.5" X 2.5". STUNNING ROYAL ALBERT CUP & SAUCER BUCKINGHAM SERIES COBALT BLUE & GOLD. Beautiful condition - no chips, cracks or repairs. Please take a good look at the photos before buying; you will receive the pictured items only. Vintage Royal Albert BLUE PANSY Square Salad Plate - 7 3/4"